Visions of "Lifting the US Election"
I meditated at 7 pm New York time on Sunday November 6, along with millions around the world in a 15-minute synchronized meditation focusing on "Lifting the US Election." It was not an endorsement of a particular candidate, but "simply using the power of joined intention and prayer to manifest the best outcome for the entire planet." And it may well have more effect than a vote cast at the polls, particularly a conflicted vote. In my meditation I saw the Earth as a jewel in space. A huge white rose, tinged slightly with pink, gently and succulently bloomed out of the North Pole. Then the petals fell, drifting to the South Pole, where they magnetically connected with a luminous thread, creating a pulsating translucent mandala, which was beating like a heart, each side fluttering. 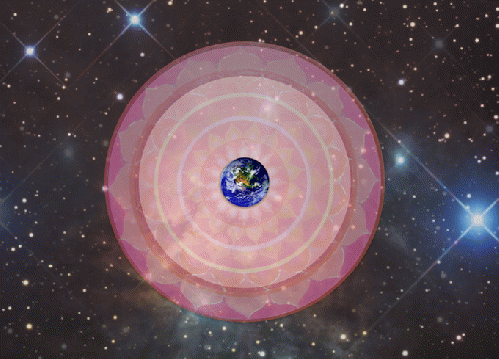 The whole mandala was enlarging and enveloping the world with love with each beat. The website for World Peace Pulse notes, " Over and over we've seen miracles occur whenever massive numbers of people focus their positive energy at the same time." 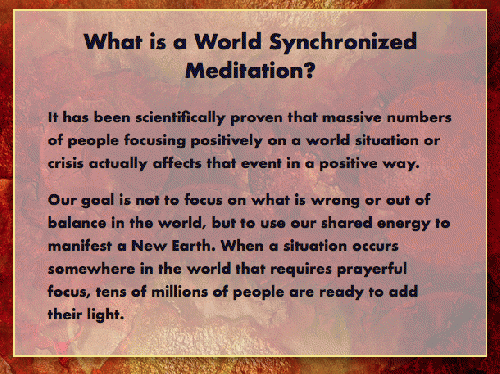 To find out more about the next worldwide meditation event, go to World Peace Pulse.